Sure, some mornings are full pancake, bacon and egg mornings, complete with orange juice and coffee and all the little details in between. Of course, we’d all like it if every day started with a big old plate of French toast, prepared lovingly by someone else and perhaps served in bed, alongside a big bouquet of flowers. Alas, real life is not quite so perfect. For one, we’re usually stuck on a time crunch — subject to early work schedules, plus kids to get dressed, brushed and out the door just in time for school. With all those commitments, breakfast often takes a backseat. We eat energy bars in the car, if anything at all. If we’re lucky, maybe a bacon, egg and cheese sandwich on the way to the office. Many of us claim we’re simply not in the mood for the most important meal of the day. Yet, the fact remains — most of us start the day with a little more pep in our steps when we actually get to eat something great first thing in the morning. It’s your fuel for getting the ideas going, and doing all that moving around. Because we understand the challenges of balancing eating and cooking with all of life’s myriad challenges and obligations, we’ve come up with just the solution you need to turn your breakfast conundrum into a full-fledged resolution. Enter the one-cup-wonder. In case you’re not following, we’re talking full meals made in one cup, in less than five minutes. These meals are easily made in the microwave and are the perfect way to “hack” the breakfast system, so to speak. If you’re still not completely sold, check out these recipes below. You’ll be a muffin in a mug evangelist in no time! We promise. We all love muffins, but sometimes you just want one hot one at a time. This easy-to-make muffin in a mug recipe will help you get breakfast done and eaten, and yourself out the door, in under ten minutes, and provides an easy hack for the days where nothing sounds better than a freshly baked muffin. In a large, microwave-safe mug or in Xtrema’s 1 Qt saucepan, mix all the ingredients in the muffin portion of the ingredient list, other than the raspberries, and mix until thoroughly blended. Add raspberries and stir together gently. In a separate mixing bowl, mix the crumble topping. Drop the crumble over the top of the muffin batter, and then stick in the microwave. Microwave for about 90 seconds, then let cool and enjoy! You can also make this the night before and then warm up in a toaster oven to make it extra crispy on top the next morning. Okay, so quiche in a mug doesn’t sound like any easy undertaking at all. On the one hand, you know this is typically a lovingly prepared dish that emerges from the oven to feed hungry breakfasters. Yet, it seems most people don’t know about this delicious hack that makes a personal quiche easy, whether you’re running late for work or you’ve got time to read the paper. First, place the spinach in a large, microwave-safe mug with a couple teaspoons of water. Microwave for about 30 seconds and drain the water if it hasn’t evaporated. Add eggs, cheese and ham, along with salt and pepper. Mix thoroughly, until all ingredients are combined, including the spinach. Cover the mug with a moist paper towel (so ingredients don’t dry out) and microwave on high for about four minutes, or until the eggs are cooked to your preference. Let cool, and eat up! A sweet take on last night’s leftovers. A little cinnamon and spice takes your favorite workhorse grain to a completely new level. Plus, it only takes a few minutes to whip this whole thing up. Sub out the rice for quinoa, bulgur or any other grain you’ve got a little too much of in the fridge — heck, you can even use plain old oatmeal if you’re so inclined. This one microwave breakfast leaves no excuses for wasted food! In a large mug, add rice and break apart with a fork. Combine cinnamon, nutmeg, raisins, almond milk and almonds in the same mug, mixing together with the brown rice until each ingredient has been evenly distributed. Top with brown sugar and place in the microwave. Cook for a minute and a half, or until the ingredients are heated all the way through and the brown sugar becomes a bit crystallized. A little bit of a treat, this oatmeal-based recipe makes for the perfect decadent microwave breakfast in a mug for all those mornings where you need something special to get you motivated. Pair with a cup of coffee, add some fruit and eat it on the go! In a large, microwave-safe mug, beat the egg then stir in vanilla extract, butter, brown sugar, oatmeal, milk, cinnamon and trail mix. Microwave the mug on high for about a minute. Remove from the microwave and stir. Cool for another minute or until the edges look golden brown. A little decadent for a breakfast mug recipe, but hey — you only live once, and peanut butter has some protein and healthy fats. Probably not an everyday breakfast occurrence, but some days deserve a little more of a reward than others. In a large coffee mug, whisk egg until fully blended. Then, add all the other ingredients. Mix together until thoroughly blended and the mixture is smooth. Microwave on high for about two minutes. Check to see if the ingredients are fully cooked. Use a toothpick to test by poking the middle. If it comes out clean, you’re in the clear. If it needs a little more time, microwave for another minute. Rather than make all the ingredients individually, simplify the process and use fewer dishes for a low-key, deconstructed breakfast sandwich straight out of the mug. Sure, you do have to eat this one with a fork for best results, but the eggs, sausage and more will all be ready to go in less than five minutes. Enjoy! In a large coffee mug, add egg and milk, whisking together until thoroughly blended. Add sausage, onions, mushrooms and bagel pieces and gently mix together, coating all contents with egg mixture. Add mug to the microwave and cook on high for about a minute. Top mug with cheese and cook for another minute, or until cheese is melted. Remove from the microwave and serve. Part dessert, part hearty way to start the day, a quick and easy pudding is a great alternative to the usual milk and cereal drudgery. A little fig, nuts and cinnamon provide the perfect companions to a hot cup of coffee. In addition, you’ll be full right up until lunchtime rolls around! In a large, microwave-safe mug, place the dates, chia seeds and hot water. In a separate container, crack the egg and whisk the yolk and whites together. Add the baking soda to the seeds and figs and stir into the mixture. Let stand for about a minute. Add butter or ghee to the mixture and microwave for about 45 seconds, allowing the butter to melt. Add the nuts, flour, brown sugar, cinnamon, cloves, oil and milk to the mug, whisking the ingredients together. Add half of the egg mixture to the mug, stirring until all ingredients are completely blended together. Microwave on high for about a minute or so, or until all the contents of the mug have been heated all the way through. Dress up your eggs with a bit of salsa! This fresh take on huevos rancheros lets you bypass your favorite brunch spot when you’re running low on time. Eggs and beans are a great source of protein, while fresh pico de gallo adds a little more flavor than your basic scrambled eggs. Whisk together eggs and milk in a large, microwave-safe mug. Add beans and salt and pepper to the mixture and stir in the cheddar cheese. Microwave for about a minute, and then remove the mug, stirring once. Add the chips and place back in the microwave for another minute, or until the eggs are cooked to your preference. Remove from microwave and top the contents of the mug with avocado slices and pico de gallo. A little fruit and protein is the best way to fuel up when you have a long day ahead. 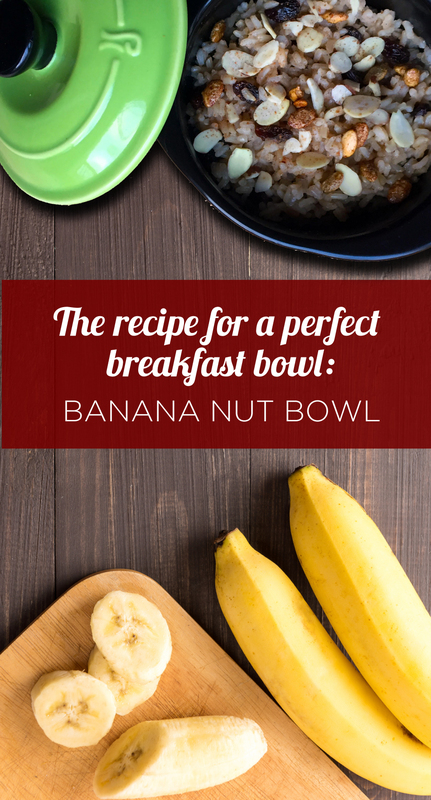 This banana nut bowl is the perfect breakfast for a smoothie lover looking for a warmer alternative, complete with rich almond butter and a hint of crunchy oats and nuts. In a large, microwave-safe mug, mix the banana, oats, almond milk, almond butter and maple syrup. Microwave for 45 seconds, taking the mug out to stir the contents. Microwave for an additional 30 seconds and remove from heat. Top the entire mug with coconut shreds and mixed nuts. For those mornings when you don’t exactly have time to spend slaving away in front of a griddle. Here’s a quick way to get your pancake fix without all the hassle, and in a reasonable portion size. We opted to do blueberry, as it’s a perennial favorite for adults and kids alike, but feel free to swap out the berries in favor of something else — banana, chocolate chips, strawberry, raspberry and apple cinnamon are all solid choices as well. Coat a large mug with non-stick cooking spray. Add egg, flour, salt, milk, oil, baking powder and sugar to the mug and whisk ingredients together until thoroughly combined. Place the mug in the microwave and cook on high for about a minute in a half. Poke the pancake with a toothpick to make sure it’s done — it should come out clean. When ready, top with jam or maple syrup and serve. Ready to Shop? Ceramcors Got Mugs! You may already be familiar with our lineup of Xtrema cookware and bakeware, as well as our Fridgex storage containers. Well, we’ve added some more items to the Ceramcor family! Our line of Ovenex mugs is perfect for coffee, tea and more — including one-cup breakfast recipes, muffins in a mug, or anything else that strikes your fancy. These mugs are dishwasher- and microwave-safe, so feel free to go nuts! Whether you’re looking to fill your mug with something sweet, savory or something a bit more traditional, like your favorite brew, our mugs are of the perfect, oversized variety — great for slow sips on a cold day, or using as a more versatile bowl.